Feb. 14, 1959: Matt Weinstock ends his week with an assortment of amusing stories, a poem and a bit of literature. Weinstock had an impressive number and variety of people feeding items to him. He made it look easy. Weinstock’s column originally ran in the L.A. Mirror in 1959 and was republished on latimes.com in 2009. The entire column is available via Archive.org. Feb. 14, 1959: It’s Saturday in 1959, and Paul Coates ends the week with some letters, a typical ploy in the days when columnists published six times a week, a punishing schedule. And there is a Parkey Sharkey alert! Also Mickey Cohen. Coates’ column appeared in the L.A. Mirror in 1959 and was republished in 2009 on latimes.com. The entire column is available via Archive.org. Feb. 14, 1882: Love and practical jokes flourish by the wagon load in Los Angeles. “More hearts are made sad by the villainous characters and miserable doggerel sent out broadcast, than can be cured before the next valentine day comes around. The American people are a nation of jokers and never lose a chance to play a practical joke and this chance cannot be lost, however much pain may be given. This item appeared in the L.A. Times in 1882 and was republished in 2009 on latimes.com. It is available via Archive.org. Feb. 13, 1959: Matt Weinstock ends the day with a few thoughts about Valentine’s Day. Plus the usual assortment of short poems and amusing stories. The Mirror’s copy desk must have had some wags. I was about to say that they must have had more down time in the days of hot metal and typewriters, but of course with multiple editions, they kept pretty busy. Weinstock’s column ran in 1959 in the L.A. Mirror and was republished on latimes.com in 2009. It is available via Archive.org. Feb. 13, 1959: Paul Coates takes another look at Americans held in jail in Tijuana. Those who were arrested in a raid on a Rosarito Beach casino were the elite. A man who was being held for running a red light was not so fortunate. This column originally appeared in the L.A. Mirror in 1959 and was republished on latimes.com in 2009. It is available via Archive.org. Feb. 12, 1959: After World War II, many Americans assumed that penicillin had eliminated venereal disease (STDs to you youngsters). And, no, it was still around. This column originally appeared in the L.A. Mirror in 1959 and was republished on latimes.com in 2009. It’s available via Archive.org. Hollywood has always been creative in promoting its films and personalities to the public. Employing posters, lobby cards, window cards and photographs, silent film production companies hyped upcoming films. With the success of these forms of advertisements and publicity, companies began selling or giving away photographs, buttons, pillow tops, plates and pennants featuring likenesses of popular moving picture stars as souvenirs and collectibles to eager fans. The film industry was usually not the first to conceive of ideas; instead, it built on successful practices and gimmicks of other fields. One such popular practice the silent film industry quickly copied was the manufacture and distribution of small felt pennants promoting either producing companies or the film stars of such organizations. This week’s mystery movie was the 1942 MGM film “Eyes in the Night,” with Edward Arnold, Ann Harding, Donna Reed, Horace McNally, Katherine Emery, Allen Jenkins, Stanley C. Ridges, Reginald Denny, John Emery, Rosemary de Camp, Erik Rolf, Barry Nelson, Reginald Sheffield, Steve Geray, Mantan Moreland and Friday. Produced by Jack Chertok, screenplay by Guy Trosper and Howard Emmett Rogers, from a book by Baynard Kendrick. Photography by Robert Planck and Charles Lawton, music by Lennie Hayton, recording by Douglas Shearer, art direction by Cedric Gibbons and Stan Rogers, set decorations by Edwin B. Willis and Edward J. Boyle, gowns by Kalloch, editing by Ralph Winters. Directed by Fred Zinnemann. “Eyes in the Night” was Anne Harding’s first picture since 1937 (“Love From a Stranger”). “Eyes in the Night” is available on DVD from TCM. Dear friends and members of the Brain Trust. We lost a charter member with the death of Ed Fuentes, who apparently suffered a fatal heart attack, according to Facebook. Ed was the subject of my first column at The Times and I was so pleased to let latimes.com readers know about him. A huge loss. In every sense, Fuentes is larger than life. He’s not exactly tall and not exactly slender, often a bit rumpled, with a few days of stubble and a full head of hair like coarse steel wool. He’s always equipped with at least one camera and a broad sense of humor. In fact, when he said we could meet at the Pie Hole, a restaurant on Traction Avenue, I thought he was joking. It is his passion for downtown L.A. that has set him apart, chronicling its renaissance and emerging arts community over the last half a dozen years in a series of blogs that give a sense of the area’s history as much as its beauty, including his own View From a Loft and, most recently, Departures for KCET. He may be little-known to large segments of the city he loves, but in downtown, his voice has endured. Feb. 6, 1959: The wildly popular Warner Bros. TV show “77 Sunset Strip” has people visiting the location at 8532 Sunset Blvd., next to Dino’s, and writing letters. Lots of letters. Kookie, man. Weinstock’s column was originally published in the L.A. Mirror in 1959 and republished on latimes.com in 2009. It is available at Archive.org, daddy-o. Feb. 6, 1959: Paul Coates writes a happy ending to the Lewis “Butch” Harris saga. This comes after the Sentinel reported a different outcome. Coates’ column originally appeared in the L.A. Mirror in 1959 and was republished on latimes.com in 2009. It is available via Archive.org. Feb. 3, 1939: Nuestro Pueblo, by Joe Seewerker with illustrations by Charles Owens, was one of my favorite discoveries in The Times. The columns were collected and published in a book that is also one of my favorites. It’s a bit hard to find but worth the search.. This column originally appeared in the L.A. Times in 1939 and was republished on latimes.com in 2009. It is available via Archive.org. March 5 1902: Apparently lying with a cinder block on the stomach is a “cure” for the “emaciated” woman. This story originally appeared in 1902 and was reposted in 2009 on latimes.com. It is available via Archive.org. I’m particularly interested in this line because Rachmaninoff (Kristof Konrad) shows up in “I Am the Night” while Man Ray (Exhibit B in the George “Evil Genius” Hodel franchise) doesn’t appear. Possibly the Man Ray Trust frowned on the depiction of him as a maniacal killer. 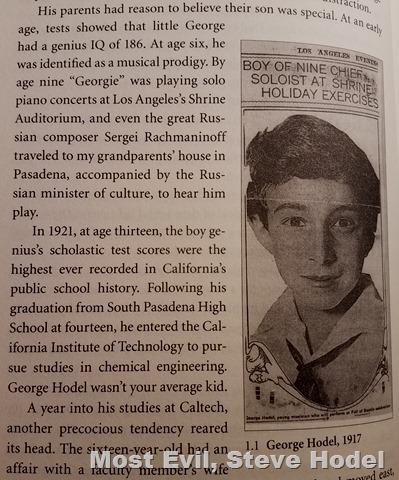 Previously on George Hodel, piano prodigy. Do you love research? Of course you do or you wouldn’t be reading the Daily Mirror. But do you love research about the Hodel family? Possibly not. Feb. 4, 1959: Anecdotes, a poem and some amusing stories. Another light column to finish the day at the L.A. Mirror, courtesy of Matt Weinstock. The column originally appeared in the L.A. Mirror in 1959 and was published on latimes.com in 2009. It is available via Archive.org. Feb. 4, 1959: Paul Coates does more reporting on the case of Americans being held in Tijuana after a raid on a gambling casino in Rosarito Beach. The story originally appeared in the L.A. Mirror in 1959 and was republished in 2009 on latimes.com. It is available via Archive.org. In sports, Wally Moon, Gil Hodges, Carl Erskine, Jim Gilliam and Larry and Norm Sherry sign contracts and Keith Thursby has the story. The post originally appeared on latimes.com in 2009 and is available via Archive.org.